When the Takeout staff concocted Unhealthy Salads Week, I was thrilled, naturally. What should I make: An 17-layer taco salad? Something with a lot of mayonnaise and pasta? Fruit and coconut? But then my memory banks settled on a dish I have long admired from afar but had never actually eaten: the strawberry-pretzel salad. 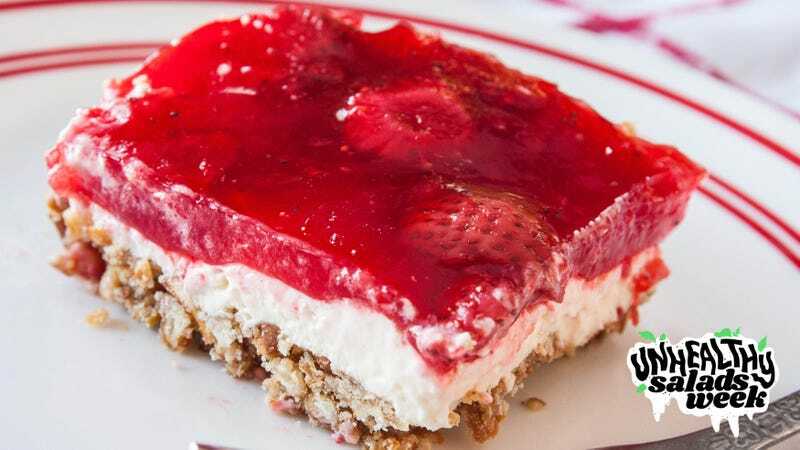 The strawberry-pretzel Salad has three specific layers: a crushed pretzel crust (with a ton of butter and a little sugar), a filling made of cream cheese and Cool Whip (and even more sugar), and strawberries in strawberry Jell-O on the top. It defies description—although come on, it’s actually a pie, right? Why is it called a salad? I believe this harkens back to the days of mid-century Americana where basically anything Jell-O-related was considered salad. I had an aunt who possessed one of those Jell-O molds with a snap-on top so you could add different shapes at the top of your creation: a tulip, a Christmas tree, whatever. She favored putting things like shredded carrots in Jell-O. Canned pears. I wouldn’t even have put olives past her. Throw it all on a lettuce leaf and it’s a salad. So calling this dish a salad just seems like a nostalgic carryover from that era. I was happy to have the excuse to make this dish for whatever reason, even though I can’t remember the last time I actually made Jell-O (when I was a kid, I used to mix those packets into milk and drink them). Or purchased Cool Whip, for that matter. Gotta say, smashing pretzels is relaxingly therapeutic. The biggest thing this dish requires is time. You have to cook the crust and then give it enough time to cool before you add the filling, otherwise all that Cool Whip will melt. You have to chill the top layer but not so much that it actually hardens. And you have to keep the whole prepared thing in the fridge for several hours to set. Still, it seemed like the ideal dish to have ready for the kids when they got home from summer camp, like I was an actual Betty Crocker mom who wears an apron. Upon finally tasting it, it’s pretty clear to me why this dish has been popular since Moses was a boy. The crust ended up tasting exactly like toffee; unfortunately, it was also as sticky as toffee, so even though Betty Crocker called for an ungreased pan in the original recipe, I should have sprayed some Pam on there. But the cheesecakey middle and hint of “healthiness” with the Jell-O and fresh strawberries (another alteration) made for an extremely palatable mid-day snack, or something that would get destroyed within seconds at your next neighborhood potluck—even if it’s a bit less than photogenic, and honestly, a little messy. I let the kids have seconds. Hey, it’s a salad. Dissolve gelatin in boiling water. Stir in strawberries; refrigerate until partially set, about 1 hour 45 minutes. Heat oven to 350 degrees Fahrenheit. In medium bowl, mix crust ingredients. Press into greased 13 x 9-inch baking dish. Bake 10 minutes or until set. Cool on cooling rack. In medium bowl, beat filling ingredients with electric mixer on medium speed until smooth. Spread over cooled crust. Cover and refrigerate until cool and gelatin topping in bowl is partially set. Carefully spoon gelatin topping over filling. Refrigerate 4 to 6 hours or until firm. To serve, cut into squares.